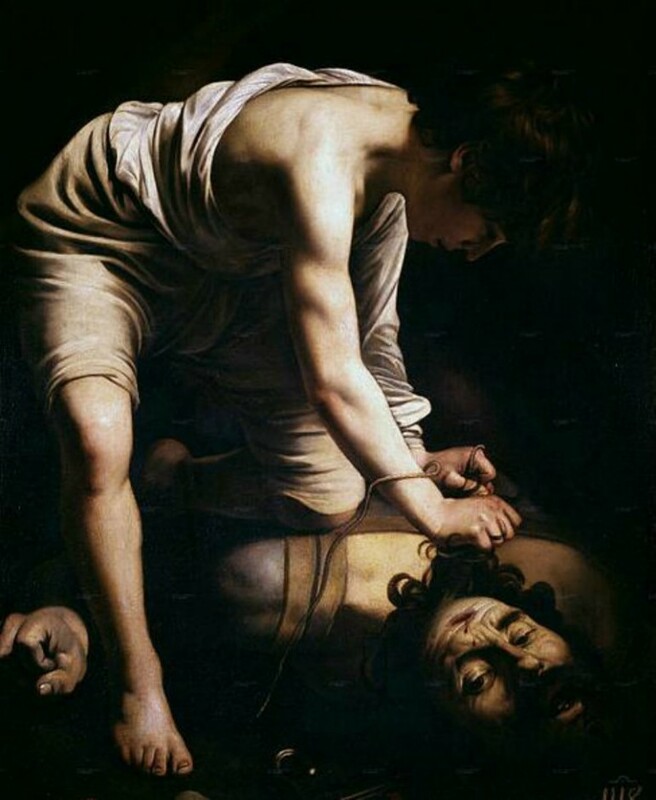 Michelangelo Merisi da Caravaggio was an Italian artist who was active not only in Rome but also in Sicily, Malta and Naples. He was born on September 29, 1571. He was known for his realistic observation of the physical and emotional state of humans and his theatrical and dramatic use of chiaroscuro, which eventually influenced Baroque painting. The higher level of chiaroscuro became known as “tenebrism,” which meant the shift from light to dark with little intermediate value. Caravaggio trained in Milan as a painter under the tutelage of Simone Peterzano who had trained under Titian. He moved to Rome in his twenties as there was a huge demand for paintings that will decorate the numerous palazzos and huge churches that were being constructed. At that time the Church was looking for an alternative to Mannerism in religious art. He proved to be very successful in Rome, starting with his first commissions, the Calling of Saint Matthew and the Martyrdom of Saint Matthew. Although he never lacked patrons or commissions, he was not good with his finances. He normally went on drinking binges, spending aimlessly and prone to brawls, which resulted in many encounters with the police wherever he went. He even had a death warrant. Michelangelo Merisi’s father was an architect-decorator to the Marchese of Caravaggio and a household administrator. His mother was from a propertied family. His family has close ties with the powerful Colonna family and the Sforzas. These families would later provide a haven and support for Caravaggio during the many times that he was running from the law. Caravaggio was very famous when he was alive. He died young though and was almost quickly forgotten. His influence in the Baroque style of painting cannot be discountedand can be seen in the works of Rembrandt, Rubens, Bernini, and Jusepe de Ribera. Some of the details of Caravaggio’s early life were sketchy but it seemed that he visited Venice and was able to see the works of Giorgione and Titian. He also became familiar with the art collection in Milan, such as The Last Supper by Leonardo da Vinci and the Lombard art style of Germany, which in contrast to Roman Mannerism, was more focused on simplicity and attention to naturalistic detail. There were three paintings he did in Rome that stood out. One was called the YoungSick Bacchus, which was supposed to be a self-portrait he did while convalescing from a serious illness. The other two were the Boy Peeling a Fruit, the earliest known painting by him and a Boy with a Basket of Fruit. These three clearly showed his physical particularity. In the fruit basket in the painting Boy with a Basket of Fruit, a horticulture professor was able to identify individual cultivars as well as the prominent fungal scorch lesion on a fig leaf, which is called anthracnose. He later formed important friendships, with young Sicilian artist Mario Minniti, painter Prospero Orsi and OnorioLonghi, an architect. Minniti became a frequent model for Caravaggio while Orsi introduced him to influential art collectors. Later Minniti also helped Caravaggio in securing lucrative commissions in Sicily. 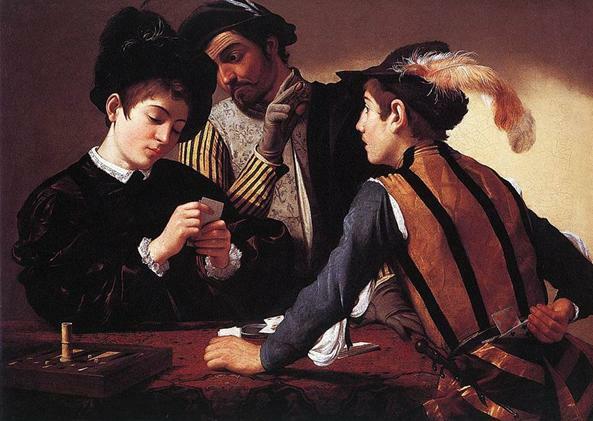 The Fortune Teller, with Minniti as one of the models, was the first composition of Caravaggio with more than one figure. The Cardsharps was another painting with multiple figures. Both of these paintings showed a naïve youth falling victim to cheaters. It could be considered his first masterpiece, as it became so popular and had several copies and also led to the patronage of Cardinal Francesco Maria del Monte. He created several paintings for the Cardinal and the wealthy patrons in his circle, such as the Boy Bitten by a Lizard, Bacchus, The Lute Player and The Musicians. His realism was carried over to his paintings with religious themes, which is one of the things that made him really famous. But while he became “the most famous painter in Rome” he was also derided by many and some of his works were rejected, because the religious personalities found it vulgar that his female models for religious paintings were prostitutes. Caravaggio was renowned for his naturalism and preferred to paint his subjects as he saw them, including their defects and natural flaws. He was not one to perform lengthy preparations for his painting, usually directly working in oils from the subject. His works were rediscovered by artists from the 20th century.